Product prices and availability are accurate as of 2019-04-21 00:19:48 EDT and are subject to change. Any price and availability information displayed on http://www.amazon.com/ at the time of purchase will apply to the purchase of this product. VENOVA ROSE provides brand confidence in beauty products. The Venova Rose hair straightener gives you a stylish professional look in no time. It's the best choice for fast, safe and effective hair straightening. 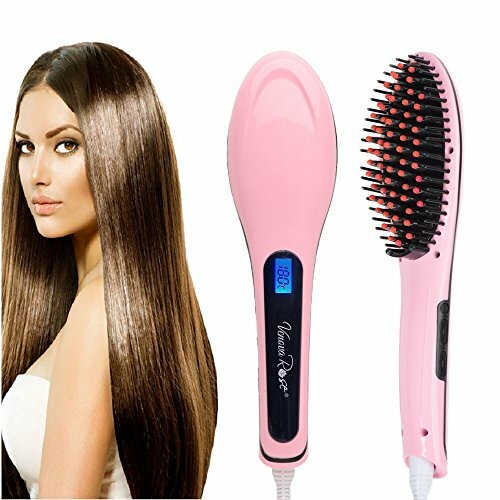 3 FUNTIONS: ceramic iron straightener, detangling brush and anti- scald hair massager. 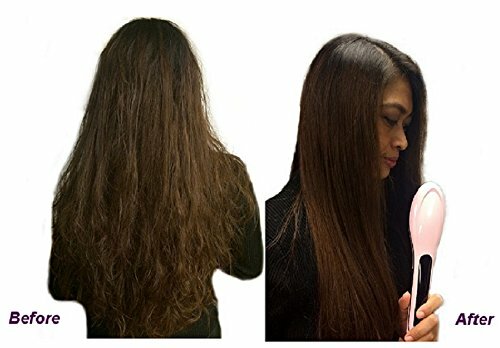 For thick hair, waves and curls: 210 - 230° C.
For normal hair: 190 - 210° C.
For fine hair: 170 - 200° C.
Choice of 11 TEMP modes with LCD display. TIP: We recommend that you choose the highest temperature at first and then reduce the temperature as needed. Clean, dry and neatly comb your hair before use. Insert plug into proper socket. Turn it on by pressing and holding power button for 2 seconds and adjust to desired temperature. Use the " + " and " - " buttons to change the temperature. Each press changes the temperature by 5° C.
Use one hand to hold the end of your hair, and use your other hand to comb through with the straightener. It is best to work through your hair section by section. Adjust the size of hair sections used according to your hair type. You may find that thicker hair requires smaller sections. Straightener turns off automatically after 1 hour. For long lasting styles, you may use hair styling products before use. To change TEMP display from Celsius to Fahrenheit, press " + " and " - " at the same time. PACKAGE CONTENTS: 1 Digital Hair Straightener Brush, Bonus Red Silicone Massaging Tips, and User Guide. STRAIGHTENS HAIR QUICKLY - Creates a silky smooth professional look much faster than flat iron straighteners. Brush heats up in a few minutes. Our recommendations are: For your thick hair, waves and curls use 210° - 230° C; For your normal hair use 190° - 210° C; For fine hair use 170° - 200° C. MASSAGES AND CONDITIONS - Red silicone tips provide beauty treatment and protect hair from damage. 5 extra tips are included as a bonus to ensure years of successful use. EASY TO USE - Variable temperature control works for all types of hair. Dual voltage operation (110V & 230V). 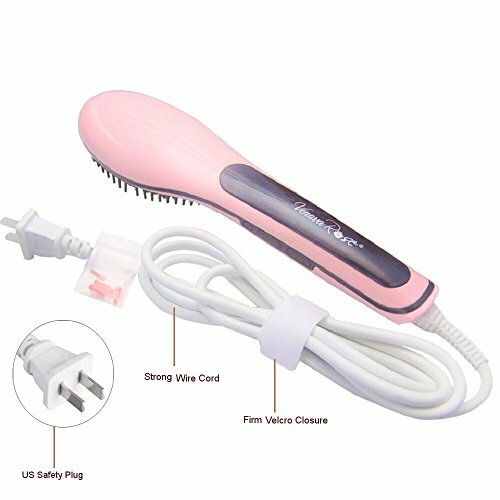 3 convenient functions: ceramic iron straightener, detangling brush and anti-scald massager. Power is 29 Watts. SAFE DESIGN - Innovative anti-scald design prevents burns. US safety plug and auto shut-off protection. Temperature is always clearly displayed on the LCD for careful control of heat application, resulting in zero damage to your hair. Product warranty is for one year. MONEY BACK GUARANTEE - To ensure your complete satisfaction, we are happy to provide a replacement or refund.